Imagine if you could forever catch the beauty of a blooming flower? Dried pressed flowers are a glorious tribute to fresh blooms. And you don't need to be an artist to turn them into a work of art. They do most of the work themselves. Dried pressed flowers can bring year round joy! Best of all, your finished dried pressed flowers can be used in flower crafts and homemade gift projects any day of the year. 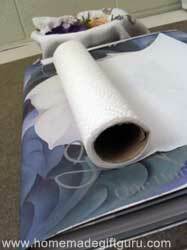 ...avoid the paper towels with bumpy designs if possible. Identify the flowers you want to press. Choose flowers that look like they will flatten out nicely. Avoid extremely meaty flowers because they don't press as well as flatter more delicate flowers. The flower should be able to be pressed reasonably flat with your fingers. With that said, try anything you are inspired to try, the worst that can happen is... you won't try that again! 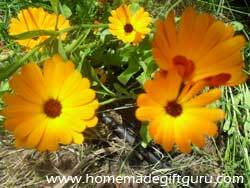 When possible, pick flowers on cool mornings and early afternoons. Try to wait until dew is dried but flowers are still perky and cool. Press flowers immediately (store flowers in refrigerator for a short time if needed). Open a heavy book and lay down a layer of smooth paper towel. 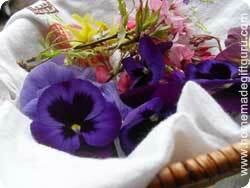 Place flowers on paper towel and carefully squish them down a little with your fingers. 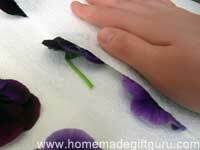 Make sure different flowers won't touch each other when pressed (they will stick). Adjust the positioning so each flower lays ready to be pressed in an attractive fashion. For example, the cherry blossom above would naturally press with petals closed... a much less attractive position than if you force some of the petals open so once pressed the flower shows its beautiful insides. 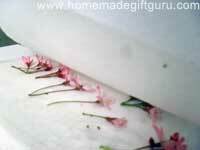 Place a layer of paper towel over flowers. Do your best to keep flowers positioned nicely. Hold flowers until the last second if needed. Holding everything down with one hand, close the book. Then place it under something heavy such as more books or a heavy box. Allow flowers to press and dry for a couple weeks. Tip: Keep a phone book (or large book) in a handy spot with paper towels in place so that when you see a flower you want to press, you can do it right away. It's always sad to miss an opportunity to press and save a delicate flower in it's prime but once pressed, you can use it in flower crafts any time of year! ...Opening your pressing book to see your finished pressed flowers for the first time feels like Christmas morning, and if you decided to get adventurous by experimenting with several different plants, the experience will be all the more exciting, enjoy! Now that you have some gorgeous pressed flowers, it's time to use them in your pressed flower crafts. 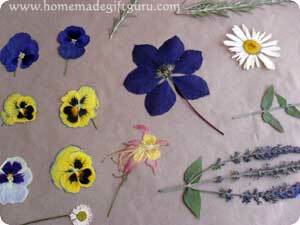 You can turn your dried pressed flowers into a variety of homemade gifts. For example, you can frame them, make them into greeting cards or decoupage them onto candles, notebooks or picture frames. A single pressed flower can be a masterpiece. So... frame your beautiful bloom and you'll have a gorgeous homemade gift. The size of the frame will depend on the flower and the end result you're looking for. For example, larger frames go well with an elegant mat in a coordinating or contrasting color (or a subtly patterned mat) or even a few different sized mats layered elegantly around the flower. Or, tiny framed flowers make great magnets. Frames can be found in very small sizes such as 2 1/2 " x 2 1/2" (or even smaller). Put your pressed flower in a small frame and then hot glue a magnet (available at any craft store) to the back of the frame. In some cases you can also embellish the frame with a little bit of raffia or ribbon. The "frame" to the right is a juice lid gone pretty! Find one of your most exquisite pressed flowers (maybe even a graceful sprig of pressed flowers) and make a pretty plaque. Include a playful word or a lovely quote underneath for a thoughtful gift of wall art. Glue pressed flowers to the front of a homemade greeting card and voilà... it's like art! 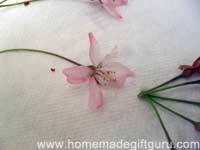 Layer paper, if desired and spray the flower with sealer or paint lightly with varnish. Keep it simple or make a flower scene. It's hard to go wrong with a pressed flower on the front of your card. 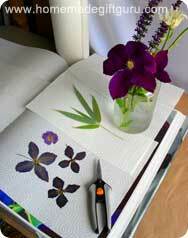 Other things you can do with pressed flowers? Photo Album. Decorate the front of a photo album. 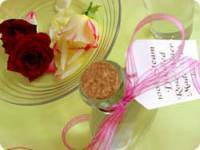 Protect flowers with contact paper, varnish or sealer. Stationary. Make pressed flower stationary by arranging beautiful pressed flowers around the border of a single piece of paper or however you like. Scan the final design and print several pieces. Trim if needed, provide envelopes and tie together with raffia and a small bunch of hang dried flowers (put a pen through the tied knot for an extra touch). Tin Container. Decorate a small tin container. Glue and encase flowers with varnish and/or sealer. Fill the tin with homemade bath powder, bath salts, or homemade treats from the kitchen. Journal. Embellish the front of a homemade or store bought journal. Light Switch Cover. 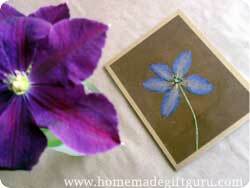 Paint and then decoupage dried pressed flowers to a plain wooden or metal light switch cover. Keepsake Box. Paint and then decoupage flowers to a plain wooden box. Put a meaningful or uplifting message or photo on the inside of the lid. Votive Holder. Decoupage pressed flowers to the outside of a large glass votive vase. Abstract Flower Art. Use dried pressed flowers and leaves to make abstract butterflies, dragonflies and even fairies for the front your homemade cards, wall art or any of the items listed above. Use paint, twigs and other materials when needed. I hope you press lots of beautiful flowers and please feel free to share your flower craft creations in the HomemadeGiftGuru gallery! 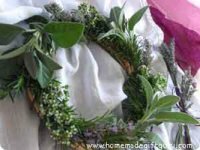 How to Make a Beautiful and Fragrant Herb Wreath!